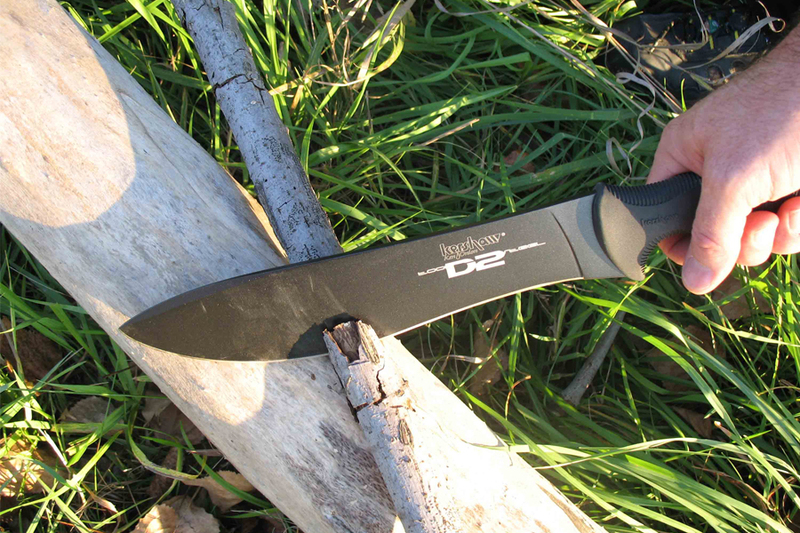 When you’re camping, you seriously need a knife that you can depend on. A model with a nice strong blade that won’t come loose is essential. The blade must stay sharp, and the tip can’t be chipping on you. Your camping knife becomes even more essential when you need it to perform a number of tasks life slicing rope, skinning game, cutting wood, or fashioning tools and weapons. Every mountain man, and woman, depends on their multi-use knife to help them to perform the daily tasks that come with being in the outdoors. When choosing the right knife, there are a number of factors that you should take into consideration. Begin by looking for a knife that is in your price range. Make sure that the weight is to your liking, and the sharpness remains in pristine condition for as long as possible. A good, strong handle is important for getting a powerful grip, and good construction that keeps the blade from dislodging is incredibly vital as well. This folding sheath knife from Gerber is part of the brand’s ever popular survival series. The company has worked for over 70 years to produce some of the most dependable and trustworthy survival gear that you can find. Each tool and weapon they construct is designed to serve a number of different purposes in the outdoor world, making you well-equipped to take on the outdoors with full confidence. The partially serrated blade is made of high carbon stainless steel, the handle is constructed of durable rubber that is ergonomically designed in shape. Because it’s so easy to get a firm grip on the handle, you have the control to be able to cut through anything you need to. 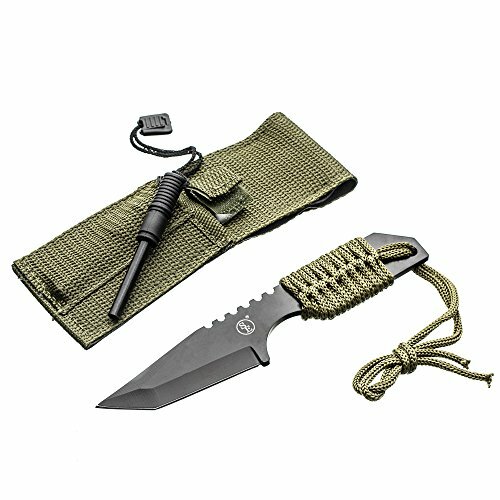 The dual-sided thumb stud makes it easy to release the blade, and then re-sheath it with the simple click of a button. This is a tremendous portable tool that will make you a believer in the power of Gerber’s products. You’ll never venture into the wilderness again without this knife. This fixed blade knife offers the sharpness, power and precision that you need to perform all the necessary tasks that come from being in the outdoors. The 5.88 inch blade is of exceptional quality, and made of 440 stainless steel. The total length of the knife with blade and handle is 10.5 inches. Keep in mind that because this blade is fixed, there’s no way to make this knife more compact, and therefore, if the size is too large for carrying around, you’re going to need to find something that folds. The rubber aluminized handle is easy to get a fine grip on, and the grooved blade is tough enough for even the most difficult jobs. There’s a lifetime warranty on this knife, so you can be sure that it is seriously going to last through a number of wilderness adventures. All in all, this is a fantastic model from Smith & Wesson, which is a brand that outdoorsy adventurers have trusted for years. 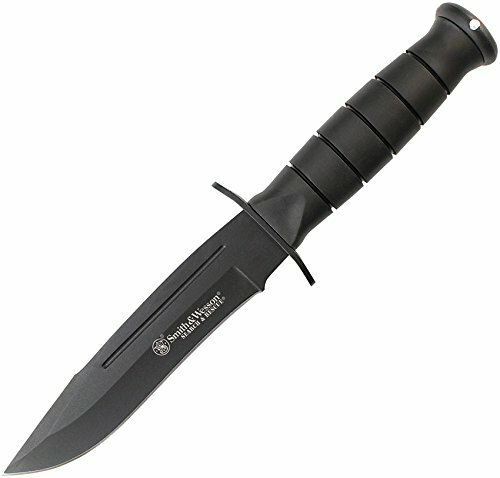 This blade from Survivor is a tremendously versatile, military-style tanto knife and a popular choice among knife enthusiasts. The thick green cord-wrapped handle makes this knife comfortable and secure in the hand, and pommel lanyard ensures that the blade is handy and accessible at all times. The green nylon belt sheath allows you to comfortably store the blade at your side, and the velcro securing strap keeps it secure. It also contains a magnesium alloy fire starter. The total length of the knife is 7 inches, so it’s not too cumbersome. A fantastic choice for outdoors enthusiasts that don’t quite consider themselves “survivalists” per se. Pretty much nothing can go wrong with this fixed blade knife, and it’s a perfect beginning for those who haven’t worked with a multi-use outdoorsy knife before. All in all, this is a fantastic choice if you’re looking to save a little money but still want a fixed blade knife that performs with the best of them.